Reading and share top 23 famous quotes and sayings about Entrances by famous authors and people. Browse top 23 famous quotes and sayings about Entrances by most favorite authors. 1. "Everyone's always tryin to find an entrance to the kingdom of heaven, she says. Me, I ain't so interested in entrances. All I want's a kingdom of exits." 2. "Before I left the castle I so fixed its entrances that never more can the Count enter there Undead." 3. "Only bad shepherds use entrances other than the door. Didn't your mother teach you anything? ""Yes, she did. 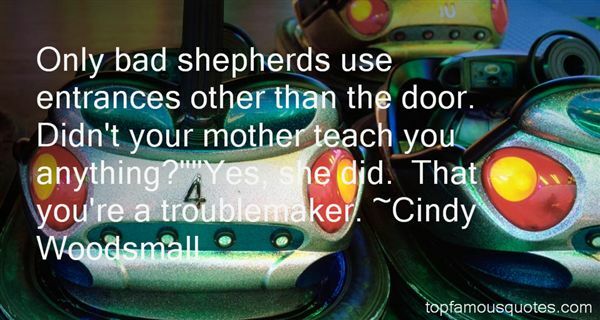 That you're a troublemaker." 4. "Sketches have characters, exits, entrances and are vastly different." 5. "All but universally, human architecture values front elevations over back entrances, public spaces over private. Danny Jessup says that this aspect of architecture is also a reflection of human nature, that most people care more about their appearance than they do about their souls." 6. "The Forgiveness Castle remains open all day and all night, and the best thing is that there are so many entrances, usually found where you'd never thing to look: behind potted plants, in crayon drawings, and on old birthday cards. I have it on good authority that one entrance is through a tree fort. Many of the Forgiveness Castle's entry points remain secret, which is why you hunt around, press the blue walls gently, and wait. Sometimes saying the most obvious words, 'I'm sorry', opens a hidden door right where there seemed not possibility. "He looks away. "You're welcome to visit this castle to wait for a friend, to sit in one of its orange and yellow gardens, or to find your own reflection in the polished blue rock and whisper, 'Please.Come home." 7. "To create, I destroyed myself; I made myself external to such a degree within myself that within myself I do not exist except in an external fashion. I am the living setting in which several actors make entrances, putting on several different plays." 8. "The fact is unalterable, that a fellow-mortal with whose nature you are acquainted solely through the brief entrances and exits of a few imaginative weeks called courtship, may, when seen in the continuity of married companionship, be disclosed as something better or worse than what you have preconceived, but will certainly not appear altogether the same." 9. "All these crushing questions; but whatever else remained the same, the light had changed, and you cannot find the pearly dawn at noonday. The fact is unalterable, that a fellow-mortal with whose nature you are acquainted solely through the brief entrances and exits of a few imaginative weeks called courtship, may, when seen in the continuity of married companionship, be disclosed as something better or worse than what you have preconceived, but will certainly not appear altogether the same. And it would be astonishing to find how soon the change is felt if we had no kindred changes to compare with it. To share lodgings with a brilliant dinner companion, or to see your favourite politician in the Ministry, may bring about changes quite as rapid: in these cases too we begin by knowing little and believing much, and we sometimes end by inverting the quantities." 10. "The story of my life is about back entrances, side doors, secret elevators and other ways of getting in and out of places so that people won't bother me." 11. "At most, a hundred paces separated him from them. The powerful beast, seeing the riders and horses, rose on his fore paws and began to gaze at them. The sun, which now stood low, illuminated his huge head and shaggy breasts, and in that ruddy luster he was like one of those sphinxes which ornament the entrances to ancient Egyptian temples." 12. "So we do have our exits and our entrances and we are perhaps mere, but I think if one keep a certain joyousness in life which should be in playing, then good for one, but it's slightly more serious than that." 13. "Thus fortified I might take my rest in peace. But dreams come through stone walls, light up dark rooms, or darken light ones, and their persons make their exists and their entrances as they please, and laugh at locksmiths." 14. "Together we made our way from the service entrances in back to the front, Jenks shedding clothes and handing them to me to stuff in my bag every few yards. It was terribly distracting, but I managed to avoid running into the Dumpsters and recycling bins." 15. "There were doors that looked like large keyholes, others that resembled the entrances to caves, there were golden doors, some were padded and some were studded with nails, some were paper-thin and others as thick as the doors of treasure houses; there was one that looked like a giant's mouth and another that had to be opened like a drawbridge, one that suggested a big ear and one that was made of gingerbread, one that was shaped like an oven door, and one that had to be unbuttoned." 16. "She shut her eyes: the sweet word "promiscuity" came to her mind and suffused her; she enunciated silently to herself: "promiscuity of ideas." How could such contradictory attitudes follow after one another in a single head like two mistresses in the same bed? In the past that nearly infuriated her, but today it entrances her: for she knows that the contract between what Leroy used to say and what he's professing today doesn't matter in the slightest. Because one idea is as good as another. Because all statements and positions carry the same value, can rub against one another, nestle, snuggle, fondle, mingle, diddle, cuddle, couple." 17. "I like to be glamorous so I love the clothing and the big entrances. It needs to be spectacular!" 18. "I do like large entrances, but this was a little too large." 19. "Tragedy's language stresses that whatever is within us is obscure, many faceted, impossible to see. Performance gave this question of what is within a physical force. The spectators were far away from the performers, on that hill above the theatre. At the centre of their vision was a small hut, into which they could not see. The physical action presented to their attention was violent but mostly unseen. 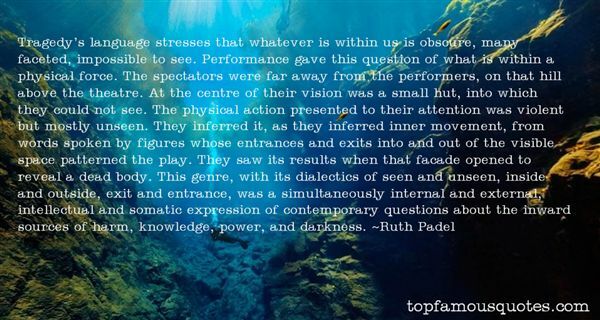 They inferred it, as they inferred inner movement, from words spoken by figures whose entrances and exits into and out of the visible space patterned the play. They saw its results when that facade opened to reveal a dead body. This genre, with its dialectics of seen and unseen, inside and outside, exit and entrance, was a simultaneously internal and external, intellectual and somatic expression of contemporary questions about the inward sources of harm, knowledge, power, and darkness." 20. "It's all right- this isn't the end of it. Endings and beginnings are as different than exits and entrances." 21. 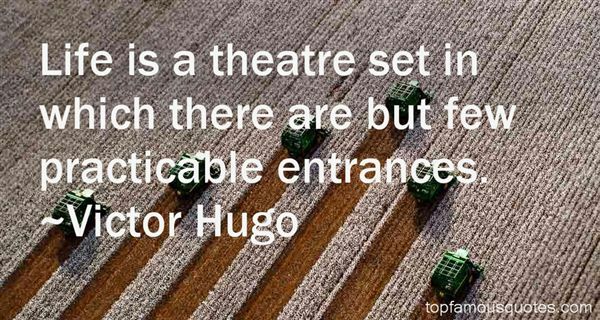 "Life is a theatre set in which there are but few practicable entrances." 22. "They do not understand that that I have to effect different transitions; have to cover the entrances and exits of several different men who alternately act their parts as Bernard." 23. "Jaques: All the world's a stage, And all the men and women merely players; They have their exits and their entrances, And one man in his time plays many parts, His acts being seven ages." Worse is man who abandons himself"